I have driven around Iowa a bit… it is the quintessential Midwest farming state, and one where monarch butterfly populations and milkweed have notably fallen. And do I remember roadside to roadside crops? Every patch of ground covered in soya or corn? Er no actually. I seem to recall that like much of the rest of the USA there is an awful lot of mown grass. Vast areas of the stuff in fact. Alongside roads, around houses, offices, churches, shops there seems to be endless acres of this utterly useless vegetation. You can’t eat it, cows can’t eat it, wildlife can’t live on it, and it needs mowing all the time. Noel may point the finger at North Americans for our love affair with lawns, but I’m going to point it right back at England and a certain influential garden designer in my next post. En garde. 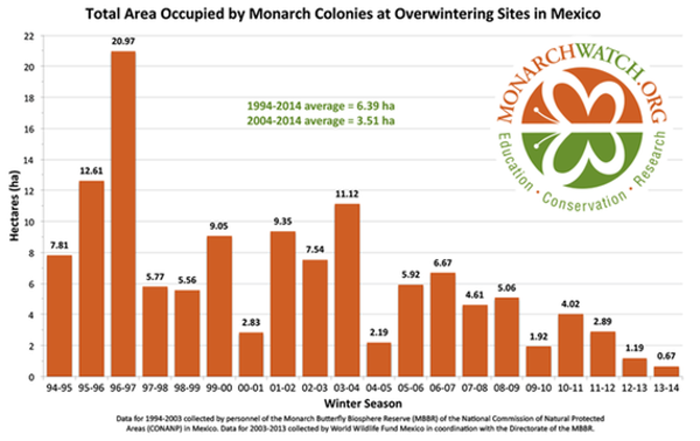 Read Noel’s blog post: Monarchs and Monsanto – a plea to think (and grow more milkweed and eat more insects).